TS ECET 2017, Telangana Engineering Common Entrance Test 2017 Result, TS ECET 2017 Result, Rank Card, Telangana ECET 2017 Result, Telangana ECET results 2017 will be declared today. The Jawaharlal Nehru Technical University Hyderabad (JNTUH) has announced that the results for the Telangana Engineering Common Entrance Test (TS ECET) will be declared today. Candidates can check their results from the official website The examination was conducted for Diploma holders and for BSc (Mathematics) degree holders for admission to Bachelor of Education (BE), Bachelor of Technology (BTech) and Bachelor of Pharmacy (BPharm) courses in the state from the academic term of 2017-18. 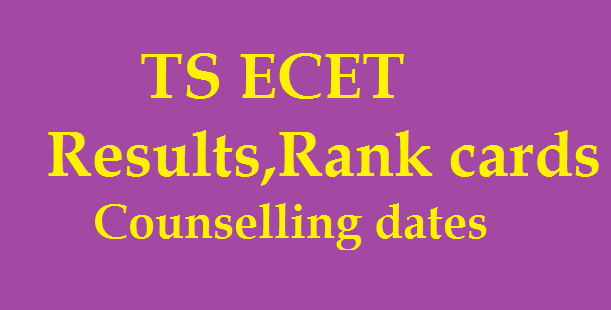 The TS ECET results 2017 will be available on the official website, ecet.tsche.ac.in. The exam was conducted on May 6, 2017 by JNTUH on behalf of the Telangana State Council of Higher Education. The examination was conducted for Diploma holders and for BSc (Mathematics) degree holders for admission to Bachelor of Education (BE), Bachelor of Technology (BTech) and Bachelor of Pharmacy (BPharm) courses in the state from the academic term of 2017-18.The exam was conducted on May 6, 2017 by JNTUH on behalf of the Telangana State Council of Higher Education. Candidates should satisfy the following requirements to be eligible for appearing at the ECET [FDH & B.Sc. (Mathematics)]-2017. (i) They should be of Indian Nationality. (iii) They should have obtained a Diploma in Engineering/Technology/ Pharmacy from the State Board of Technical Education of Telangana State/Andhra Pradesh or any other Diploma recognized by the Government of Telangana/ Andhra Pradesh as equivalent there to for admission into the relevant B.E./ B.Tech./ B.Pharm. Courses corresponding to the Diplomas as given in the following Annexure –IV.. They should have passed the 3-year B.Sc Degree examination with Mathematics as one of the subjects in the group combination from a recognized University in the Telangana/Andhra Pradesh state or its equivalent for entry into relevant courses as given in the following Annexure - IV. (iv) Candidates who are pursuing a Diploma course shall be eligible for entry into the relevant B.E./B.Tech./B. Pharmacy courses provided they have completed the practical training prescribed for the award of diploma course before admission into the college. (v) Candidates should have passed Diploma in Engineering and Technology/ Pharmacy/ B.Sc. (Mathematics) Degree as the case may be with at least 45% marks (40% in case of candidates belonging to reserved category) for entry into relevant courses. (1)For lateral admission into 2nd year regular B.E. / B.Tech. Courses in both University and Un-Aided Private Professional institutions (Minority & non-Minority) approved by All India Council for Technical Education. (2)For lateral admission into 2nd year Regular B. Pharmacy Courses in both University and private un-Aided professional institutions (Minority & Non-Minority) approved by Pharmacy Council of India. 5.Check the details mentioned on your result and then save a copy of the same for further process.